I can remember the meeting I had after I'd submitted the manuscript for my first cookbook. My editor sat me down, looked deeply into my eyes and said, "Go home and review these recipes and please, keep in mind that not everyone loves cinnamon as much as you do." They don't? How is that possible? As a baker, if I were ever (and I'm never) caught short on cinnamon, it would be as catastrophic as being out of butter, flour, sugar or eggs, the baker's basics. Just the way salt accentuates the flavors of so many savory foods (and sweets, too, but that's another topic), so does cinnamon. A small pinch of cinnamon is wonderful with chocolate, caramel, coffee, espresso and anything with butter or honey. At its most elemental, i.e. straight, a dusting of cinnamon on a cappuccino, the whipped cream on an ice cream sundae or the butter or syrup on a pancake makes something good even better. A stick of cinnamon added to mulled wine, hot chocolate or an Asian-inspired beef stew is great, and cinnamon, either stick or powder, is just about mandatory in couscous and many Moroccan tagines. There's a reason real-estate agents tell clients to boil up a pot of water with some cinnamon sticks when househunters are expected: Cinnamon is the cozy scent of home. 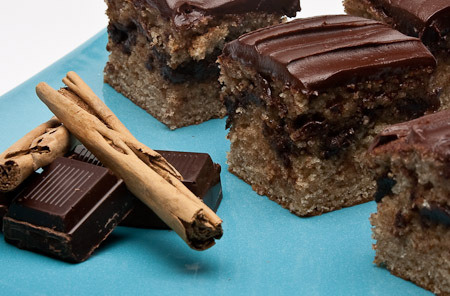 Read Dorie Greenspan's recipe for Cinnamon Squares. Called "a culinary guru" by The New York Times, Dorie Greenspan is the award-winning author of nine cookbooks, among them her most recent, Baking From My Home to Yours, and Baking with Julia. She is a special correspondent for Bon Appetit magazine and a blogger. You can follow her adventures in the kitchen and all over New York and Paris at www.doriegreenspan.com. My introduction to Dorie Greenspan's work came during a simple trip to Costco to buy a new TV. It's rare that I go to Costco without cruising down the book isle to see what cookbooks they happen to have and this visit was no exception. I spotted a book with a gorgeous chocolate cake on the cover and the word "Baking" in large type across the top of the book. I couldn't reach for it fast enough. I didn't know who Dorie Greenspan was, but I could see from a note on the cover that she authored Baking with Julia, and immediately she had credibility with me. Flipping through the book I found a nice mix of recipes, interesting flavor combinations, lots of stories (an essential element for a cookbook to interest me), good directions and guidance on baking techniques, and that beautiful cake on the over. I plunked the book on top of the giant TV box and we rolled to the checkout. I was feeling slightly ridiculous with our combination of merchandise - a TV for him and a nice book on baking for the little lady. I was actually more excited about the cookbook than the beautiful new TV. I dove right in and made scones when I got home and this was the first time I had ever made scones that were really good. Thrilling! The chocolate cake on the cover was next and was also excellent. Baking: From My Home to Yours quickly became my go-to baking book. A few years later I stumbled upon a group of bloggers who are cooking their way through this very book making one recipe each week. David set me up with my blog and I start baking right along with the Tuesdays with Dorie group. It's a timely coincidence that the recipe selection for the first week of June happens to be the Cinnamon Squares Dorie shares with us. If you want to see how the recipe turned out for 350+ bakers in the group, visit the blog roll for Tuesdays with Dorie, and you can find my post on mix, mix...stir, stir. Dorie's cinnamon squares are a delicious way to fully celebrate the glorious warm comforting flavor of cinnamon. It's an astonishingly easy cake to make that doesn't even involve an electric mixer. This moist cinnamon cake is accented with a chocolaty cinnamon ribbon of flavor running through the middle that is spiked with a note of espresso. Cinnamon, chocolate and coffee are classic flavor friends that come together perfectly adding a touch of pizzazz to this simple cake. If you can't remember the last time you bought cinnamon, indulge yourself and buy a fresh stash and spend the month working it in to a variety of dishes. I bet you will discover this very ordinary spice, cinnamon, is truly quite extraordinary. Visit our Spice Library learn more about cinnamon. Of course once I became a fan of Dorie Greenspan's work I started to notice all the different projects she is involved in. In addition to her blog, she writes a column for Bon Appétit magazine, she writes for Parade magazine, and has authored these other great books: Paris Sweets: Great Desserts From the City's Best Pastry Shops, Pancakes: From Morning to Midnight, Chocolate Desserts by Pierre Herme, and Daniel Boulud's Cafe Boulud Cookbook: French-American Recipes for the Home Cook.